In the midst of the red dunes of the Kalahari the lodge seems like a plush green oasis: the accommodation facilities are grouped around a spacious courtyard with palm trees and acacias, a succulent garden and a large swimming pool. There are 36 well-appointed rooms with a private veranda opening onto the courtyard. For individual guests 19 rooms are available in chalets which are slightly set apart and afford views of the savannah scenery. Nature lovers can choose between 3 exclusive camping sites equipped with private showers and toilets. Meals are served in the restaurant or on the huge terrace. Join a drive through Gondwana Kalahari Park at sunrise or around sunset, spend time watching vultures and marabou storks at the feeding place for carrion birds, or explore the Kalahari on foot by following one of our hiking trails. Entering the Kalahari Farmhouse is like stepping into a magical enclave or an oasis in the desert - far away from the world. The cottagey chalets with colourful patchwork quilts, fireplaces and oodles of charm look onto the garden lined with towering palms. Birds flutter through the trees, water runs in the streamlets and the feeling of peace pervades the intimate Kalahari resort. The ample water supply allows the garden to be kept lush and Gondwana's Self Sufficiency Centre to grow its produce for the collection of lodges around the country. At the Centre, adjacent to the lodge, seasonal vegetables are grown, cows are milked, and a variety of cheeses, salamis, sausages and biltong are produced. Visit the Self Sufficiency Centre, lounge around the pool or in the garden, join a sunset excursion into the burnished dunes at Kalahari Anib Lodge, 30km away, and REST. 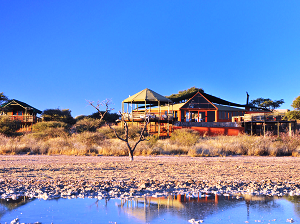 The lodge lies on the edge of the Southern Kalahari in the mixed tree and shrub Savannah. This ‘Spirit of Africa’ atmosphere, coupled with service, delivered with graciousness and charm, in an unashamedly luxurious setting providing excellent value and unforgettable memories for the discerning traveler. A rambling old farmhouse was extensively altered, upgraded and renovated to not only serve as a residence, but also as the main nerve centre of the Lodge. An entrance hall leads to the reception, lounge, dining room, bar & cellar, library and office. There is a swimming pool and recreation area with a hammock. An open air lapa for outdoor meals captures the atmosphere of an African Safari. 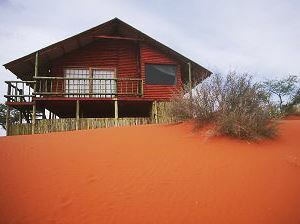 Dune Chalets, constructed of wood and on stilts are built on top of a Kalahari sand dune, with unsurpassed views to the Southwest. Strohbale Chalets are built in the street or valley between the dunes. These chalets are built of ‘hay bales’ with walls 600mm thick, the insulation and atmosphere are equally effective and tranquil. Garden Court, rooms next to the lodge have a view onto their own garden court.The garden courts are adjoined. The standard and quality of finish is the same for all chalets, with exquisite décor and equipped to exceed your expectations. Campsites are set in a wide ‘street' between the red sand dunes, each campsite has its own dedicated ablution block, toilet, shower, washbasin and mirror. The Bitterwasser farm area consists of a total of 5´500 hectares of land including a game park. 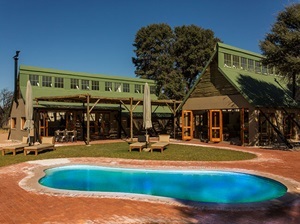 For up to 80 guests, Bitterwasser Lodge & Flying Centre offers comfortable, unique accommodation in 13 rondawels (African style huts), 22 air-conditioned bungalows, and a country house locates in the dunes. ´Non-pilots´ will enjoy the atmosphere and the typical African ambience as well - an unforgettable mix of freedom, luxury and comfort. The Intu Afrika Kalahari Private Game Reserve is a 10 000 ha wildlife sanctuary located in the south-western region of the Kalahari, along the upper reaches of the Auob river system. Grassy plains peppered with centuries old camelthorn trees commonly known as “dune streets” or valleys separate the dunes providing refuge for diverse animal and bird life indigenous to the Kalahari. 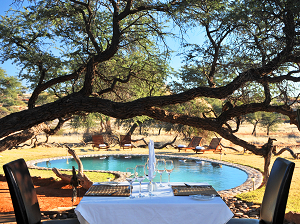 Camelthorn Kalahari Lodge is set in a secluded valley between two red sand dunes and hidden amongst ancient camelthorn trees. The Lodge consists of a thatched main building, dining area and a boma overlooking a natural stone pool, with each of the 11 double chalets offering air conditioning and private en-suite facilities. Suricate Tented Kalahari Lodge is situated on a red sand dune overlooking a pan system that forms part of the upper Auob wetlands. 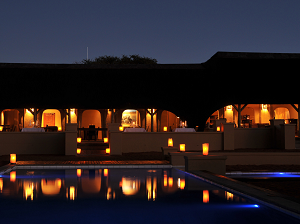 The Lodge comprises twelve luxurious walk-in-style tents, well secluded in the Kalahari savannah. Each tent offers a private deck and an intimate open air bathroom with hot and cold running water, flush toilet and shower. A cozy African-style lounge overlooking the vast grassy pans of the Auob River or the pool deck is the perfect setting for drinks and meals. 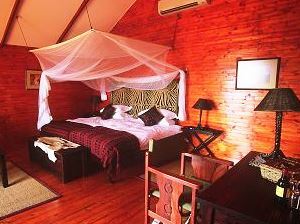 Zebra Lodge is set in a panorama of open grassy plain, acacia woodlands and red sand dunes. This unique lodge can accommodate 26 guests in twin bedded rooms connected to the main lodge building. Each air-conditioned room has an en-suite bathroom with all modern conveniences and is furnished with an elegant simplicity that reminds one of a bygone era. Stampriet Historical Guesthouse offers you peace of mind, especially during the quiet starry nights. The antique decoration will take you back to days gone by. 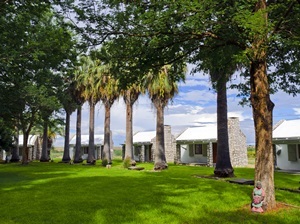 Stampriet Historical Guesthouse the clock has been turned back to bring you the undiscovered myth of history, as well as the treasures and secrets of the red Kalahari dunes. The main aim is to preserve the best of the past. 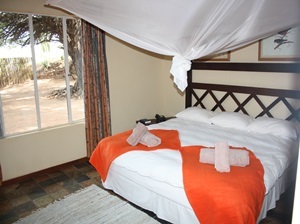 The guesthouse offers 12 air-conditioned rooms with 23 beds, a pool, a bar and farm visits on request. Buitepos accommodation consists of two lodges, each with its own unique character and ambience. The Lodge is an impressive, exclusive and comfortably elegant lodge with 2 bedrooms in the main complex and 2 nearby private double chalets overlooking a flood lit water hole. The main building houses the dining room, view deck, lounge and small pool with an open air fire pit adjacent to the pool. The Camp consists of a main cabin with two rooms, each with private bath. A small kitchen serves the lapa with a dining area, bar, open air fire pit, barbeque and a Jacuzzi all overlooking a floodlit water hole. There are also five double bungalows, each with private bath. A total of 7 rooms with 14 beds. Although you might have a special treat of a barbeque luncheon in the veldt, dinners are generally served in classic safari style, at a proper table with flickering candlelight and interesting conversation. In the time of the creation, there was a day of rest. We suspect that on this day, the bottom of the hourglass of time fell out and the Kalahari was showered with a thick layer of fine red hourglass sand, unparalleled beauty and lots of restful time. A living desert that brings you a fullness of life, richness of colours, beautiful nature and relaxation lost in time. Kalahari Game Lodge is a very special and unique place. 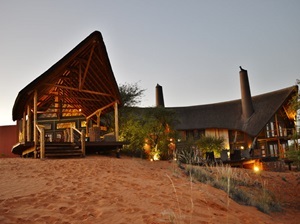 The Kalahari Game Lodge arises over the last dunes towards the eastern border of Namibia, adjacent to the Kgalagadi Transfrontier Park; it lights up the early evening sky with the Boma fire already inviting the guests to its warmth. As you enter the Lodge, you will melt into its relaxing atmosphere where you can enjoy ice cold refreshments on arrival and sit down to a delicious meal at the new Restaurant . 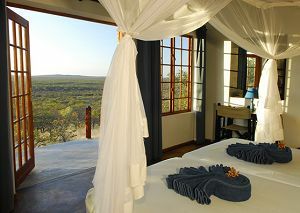 Offering Camping as well as beautiful Rooms - Kalahari Game Lodge offers eight beautiful chalets. Chalets are equipped with a small kitchenette, as well as an en-suite bathroom, patio overlooking the Auob Riverbed, where you can enjoy your morning coffee as the sun rises over the Kalahari dunes. The chalets are furnished with double or three-quarter twin beds. 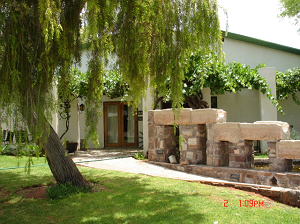 Auob Country Lodge is situated on the banks of the dry Auob River. The small town Gochas is only 6 km away. The gem in the Kalahari offers 26 en-suite double rooms, a restaurant, a lapa, a TV room and a lounge with fireplace for chilly winter evenings. The red dunes of the Kalahari are in strong contrast to the white calcareous rocks of the valley formed by the Auob river. In an area of 8000 ha around the lodge, various antelopes, giraffe, smaller mammals and many bird species can be seen. 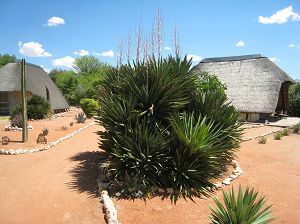 The plants in this area are well adapted to the harsh conditions of the Kalahari. Enjoy the peaceful atmosphere at the swimming pool or discover the surrounding area on foot, horseback or on a sundowner drive. A bar is at your disposal.